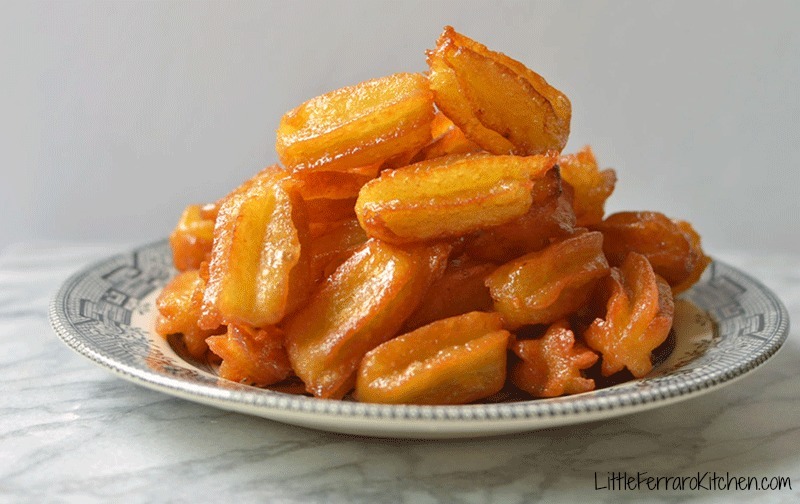 Persian doughnuts with floral flavors of rose water and saffron are also known as bamieh. I am always on the hunt for new treats and places to try and thanks to my best HS friend and her Persian beau, Joe and I have a new favorite bakery. Assal pastries is in So Cal (Irvine for local folks) and is filled with Persian treats, including these addictive sweet Persian doughnuts. 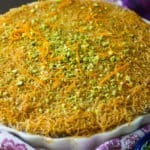 This is unlike the typical American bakeries we’re used to here and is filled with aromas or orange and rose and colors of gold and pistachio. I need to find out the names of some of the treats I fell in love with. There is one that I believe is made it chickpea flour that melts in your mouth at the touch. But the one I truly am in love with is, bamieh. I had to search for these golden gems and began googling “honey balls”, “sweet balls”…well, I was getting a little more than just doughnuts in my research. I finally found this video and knew I was in. 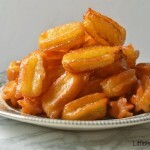 Bamieh are Persian doughnuts that is basically deep=fried dough which is then soaked in a syrup. The recipe was pretty interesting because it had you add eggs to the flour mixture (which is usually not heard of) and melting butter in water? Besides the odd technique, the dough came out super thick and sticky but then turned into light pillows of fried love. It almost reminds me of churros but without the extra dusting of sugar. The simple syrup is simple, just water, sugar and gorgeous floral, golden saffron. This recipe for these Persian doughnuts makes a lot but trust me, they won’t last long in your house. Once you coat the doughnuts in the saffron simple simple, the outside glisten’s and gets a little sticky. 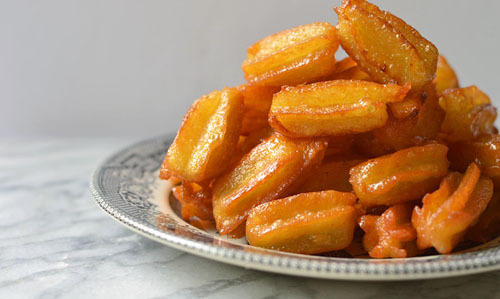 When you take a bite, you first notice the perfect outside which is crispy and sweet and then the inside is so soft and bursts with sweet syrup. The rose water is not overwhelming but noticeable as “Hmm, what is that floral flavor?” If you can’t find rose water, you can make it yourself! Here is a simple recipe. I highly suggest keeping a bottle of this addiction in your fridge. 1) Soak saffron in a bowl with 1/4c of boiling water for 20 minutes. 2) Make the simple syrup. In a small pot, add 1 cup sugar and 1/2 cup water and boil until thickened. Make sure it does not caramelize. When almost thickened, add 1 Tb rose water and 3 tsp saffron liquid to pot and continue boiling for 3 more minutes. When done, put aside. 3) In another pot, add 1 cup water, 2 Tb sugar and 3 Tb of butter. 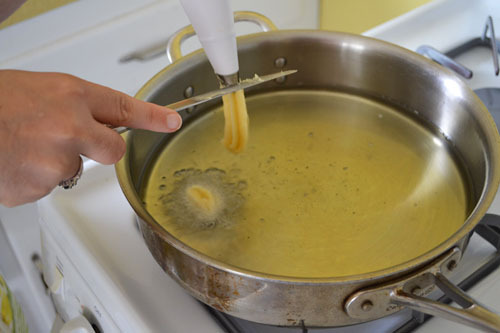 Put on low heat and stir until the butter is melted and everything blended. 4) On low heat, add 1 cup flour to the pot and use a spatula to mix the flour into the butter until it looks like a dough ball. When done, remove from heat and allow to get at room temperature (I stuck it in the fridge to help speed it up). 5) When dough is at room temperature, add it to a large bowl and mix in 2 eggs (1 at a time) until everything is incorporated. The dough is very sticky so it helps to use a hand mixer if you have one. 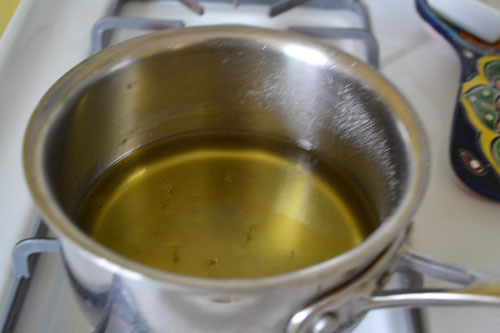 6) Heat a large skillet with 1 in of oil and bring to 3725 degrees. 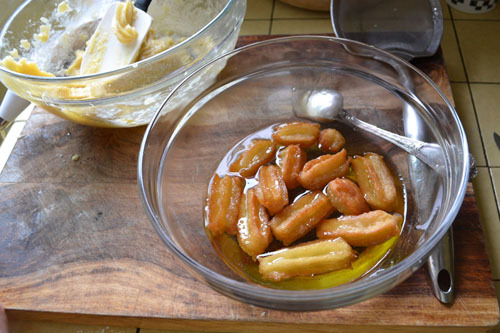 7) Transfer dough to a piping bag with desired tip and squeeze out small doughnuts into the oil. Use a knife to help cut the dough as you’re frying them. 8) Fry the zoolbias (dough) on each side until golden brown (2-3 minutes on each side). When done, use a mesh spoon to shake of excess oil and transfer them to saffron syrup. Coat the syrup all over the doughnuts. 9) Repeat until all dough and syrup is used. Soak saffron in a bowl with 1/4c of boiling water for 20 minutes. Make the simple syrup. In a small pot, add 1 cup sugar and 1/2 cup water and boil until thickened. Make sure it does not caramelize. 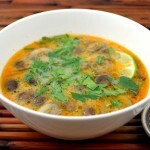 When almost thickened, add 1 Tb rose water and 3 tsp saffron liquid to pot and continue boiling for 3 more minutes. When done, put aside. In another pot, add 1 cup water, 2 Tb sugar and 3 Tb of butter. 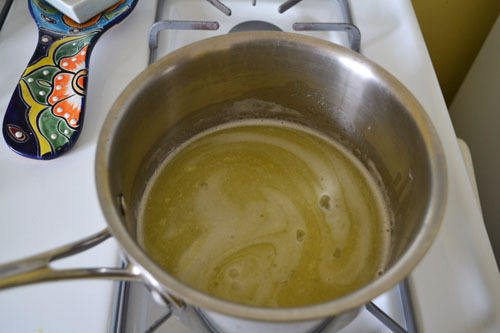 Put on low heat and stir until the butter is melted and everything blended. 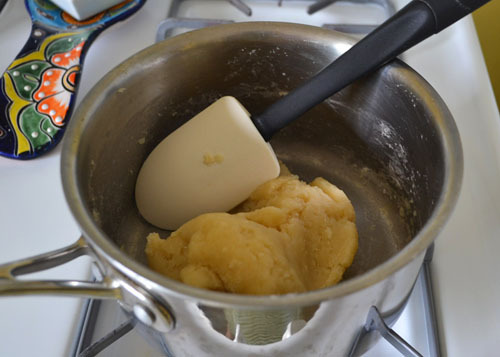 On low heat, add 1 cup flour to the pot and use a spatula to mix the flour into the butter until it looks like a dough ball. When done, remove from heat and allow to get at room temperature (I stuck it in the fridge to help speed it up). When dough is at room temperature, add it to a large bowl and mix in 2 eggs (1 at a time) until everything is incorporated. 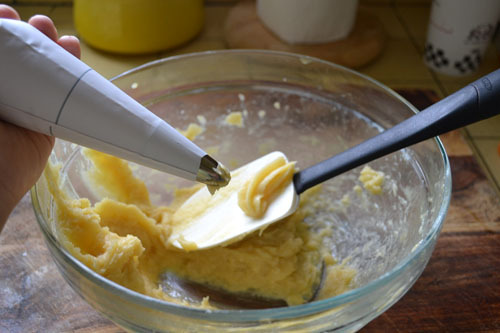 The dough is very sticky so it helps to use a hand mixer if you have one. Heat a large skillet with 1 in of oil and bring to 3725 degrees. Fry the zoolbias (dough) on each side until golden brown (2-3 minutes on each side). 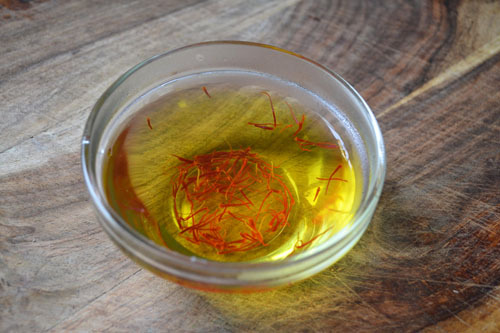 When done, use a mesh spoon to shake of excess oil and transfer them to saffron syrup. Coat the syrup all over the doughnuts. Repeat until all dough and syrup is used. 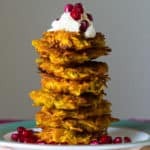 Wow, Sam, your bamieh look like little pieces of art – they’re so vibrantly golden from the saffron! 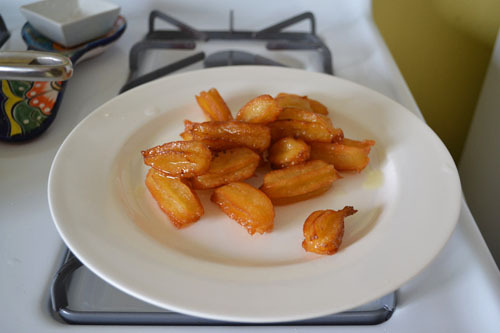 These remind me a little of loukoumades (Greek donuts) in that they’re little bites of crispy light dough smothered in syrup. I’ve never had anything made with rosewater, nor have I had a sweet dessert with saffron so I’m super intrigued. 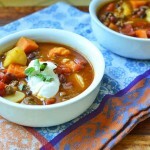 I’m glad you were able to find this recipe and can now recreate it at home! 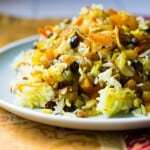 thank you for your recipe but my bamieh getting mushy ,what is the reason? Hi Narges…my only suggestion would be to check the temperature of the oil when fring. The oil should be hot enough so that it sizzles when you put the bamieh in. Good luck! Zoolbiah and bamieh are 2 different things, as in they have two different shapes. They are often served together. What you made here is bamieh. Zoolbiah looks like a web. 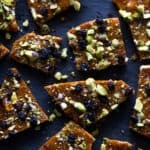 Thank you for the recipe in photo form and then written. Just learned about these Persian doughnuts but most recipes were in video form. I hate following videos to learn how to do things. The way you did it is perfect! 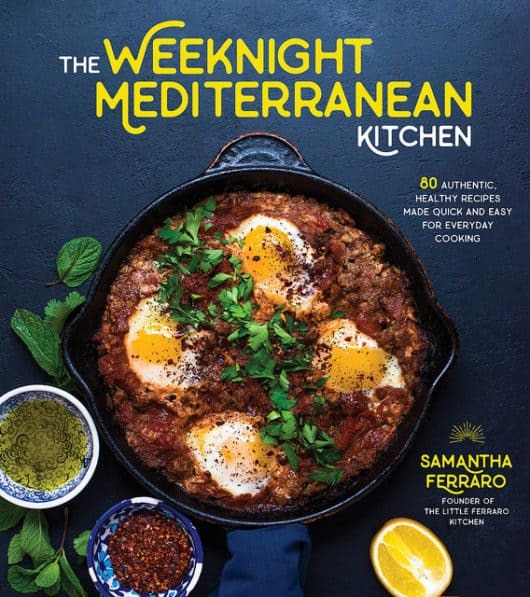 Going to look over your blog and recipes now and if I like even a few, I’ll be subscribing. Please let me know how the doughnuts came out! They are so delicious!! 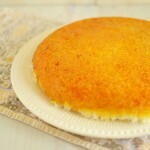 I love the saffron with rose water and honey combination…heavenly! 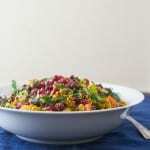 About how many servings does this recipe yield? Hi Leila! They are quite rich but small and if I remember correctly, they make about 14’ish little donuts. I would say 2-3/person so about 6-7 servings. Hello! 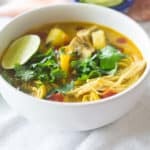 This looks so delicious, so excited to try!! One question – can the dough be made the night prior and refrigerated? Hi! You know, I have not tried that but honestly think it will be fine! Good luck and please let me know how it comes out!